Key Teaching Concepts: Counting, efficient playing technique, reading music, keeping time, having fun, learning different genres (Rock, Funk, Jazz, Latin, etc. ), developing listening. 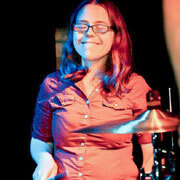 A Bay Area native, Anna has been a professional gigging and recording drummer since age 14. After coming to Music Time Academy in 2007 as an instructor and recent graduate of the University of California, Berkeley, she became sole Director of the Academy in July of 2008. Music Time Academy has since grown tremendously, and Anna (alongside fantastic Manager, Monica Lind) continues to work full time for the studio as both an instructor and administrator. As a drummer, Anna specializes in all genres of drum set, as well as and traditional/rudimental snare drum and marching percussion. She continues to perform over a hundred gigs per year with a variety of groups, including nationally touring roots/American rock band, Muncie, popular Soul/Motown party band, West Grand Boulevard and instrumental Blues/Funk outfit Seth Chapla Band, who has been featured on the video game Rocksmith. Anna is not only a professional musician, but also an audio engineer, tour manager, concert promoter, record producer, and web/graphic designer. An avid music instructor since 2002, Anna’s teaching experience ranges from private drum set lessons to high school and college drum line to preschool music classes to youth summer music camp (and everything in between). She currently leads the percussion section of the Young American Patriots Fife & Dum Band in Pleasanton, CA, in addition to working enthusiastically with students of all ages and skill levels at Music Time Academy.